A small, narrow stream flows over a mossy rock face just a little too reclined to make it a free fall. Still, some ledges launch the water into mid air in spots. It becomes a small sliding cascade near the bottom. 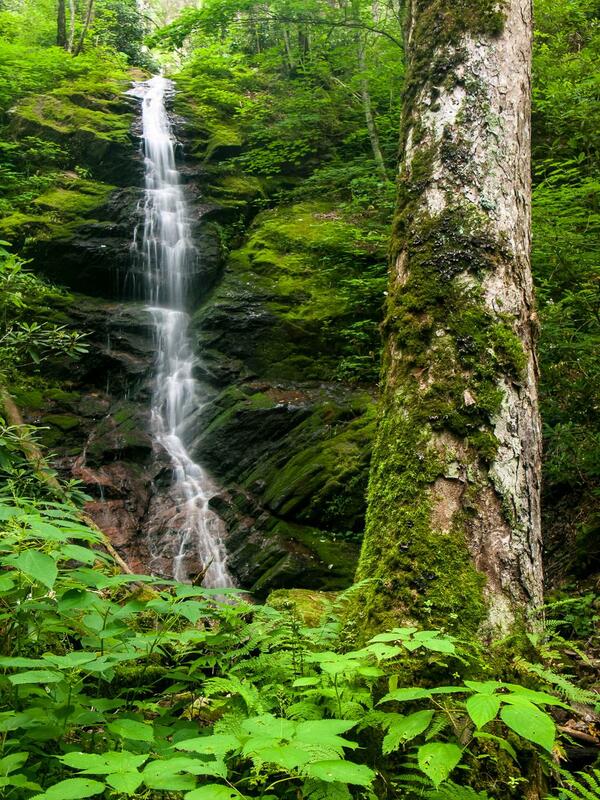 The falls is surrounded by lush vegetation of all kinds. During very dry weather this one's probably not worth seeing, but from slightly below normal to high water flow it's very pretty. And it's easy to get to. Don't trample any of the mossy rocks or plants growing at the base, but there is plenty of room to hang out without doing that and a little pool the kids can splash in. Take I-40 to Exit 7, for Harmon Den, just east of the Tennessee State Line in the Pigeon River Gorge. If traveling west on I-40, turn right at the end of the ramp; if east, turn left. This is FR 148, Cold Springs Road, and it becomes gravel. Go 3.7 miles and turn right at the signs for the picnic area and horse camping area (FR 3526). Follow this 0.3 mile, past the picnic area and horse camp, to the wide area right before the gate. Park here, but don't block the gate. Walk around the gate and find the easy path leading uphill to the left. Just a few years ago there was no path, but with this falls being listed in books and local websites it has become more popular and an obvious path has formed. The path follows the creek upstream on the right, on a gentle grade, to the base of the falls in about 0.3 mile.